Saltless water softeners create great tasting water without adding sodium. With a whole house water softener system, every tap supplies you with the best water. Even better, a water softener without salt system protects pipes from buildup and sediment accumulation. 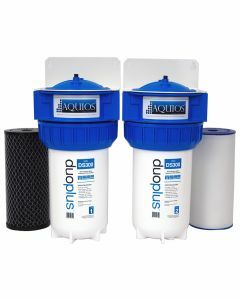 Aquios® offers the first combination salt free water softener and carbon filter system for residential use. Our no salt water softener utilizes a single cartridge that both conditions and filters your water at the point of entry into your home. The Aquios® system is an all-in-one, natural, non-salt based water conditioner combined with the powerful filtration of carbon block technology to provide you and your family with clean, great tasting, scale free water without replacing healthy minerals with salt or potassium. The technology we use in our salt free water softener systems to soften and condition your water has been utilized by the commercial food service industry for decades and has proven effective in preventing limescale and calcium build-up and reducing existing scale on pipes and fixtures. By combining this with carbon block technology, the Aquios® system effectively eliminates up to 99% of chlorine odor and taste and up to 97% of dirt and sediment*.